Saint Thomas Aquinas High School -- established in 1988 -- is best described as "A Communion of Saints; growing in knowledge, guided by Catholic values." In the mid-1980's, a soaring Catholic population in southern Johnson County prompted then-Archbishop The Most Reverend Ignatius J. Strecker, D.D., to build a new coeducational Archdiocesan Catholic high school that would integrate Aquinas High School located in Shawnee, Kansas (1980-1988, and previously St. Joseph, 1934-1980). 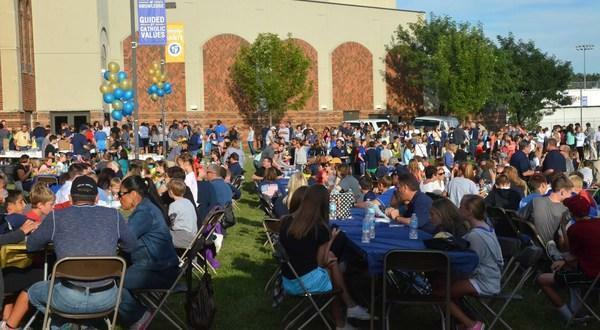 While Saint Thomas Aquinas High School adopted its own identity, it also inherited a rich tradition of dedicated Catholic families affiliated with St. Joseph dating back to the 1930's. 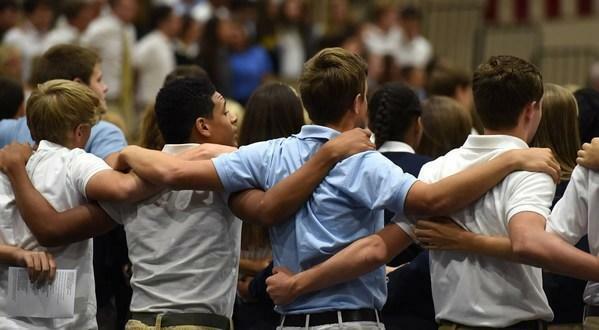 Since opening with an initial enrollment of 447 students, Saint Thomas Aquinas High School has maintained a focus on four core values in all endeavors: FAITH, KNOWLEDGE (with an emphasis on long-term learning), SERVICE and a sense of COMMUNITY. In its third decade, the school currently enrolls 976 students with 5,638 alumni since 1989. 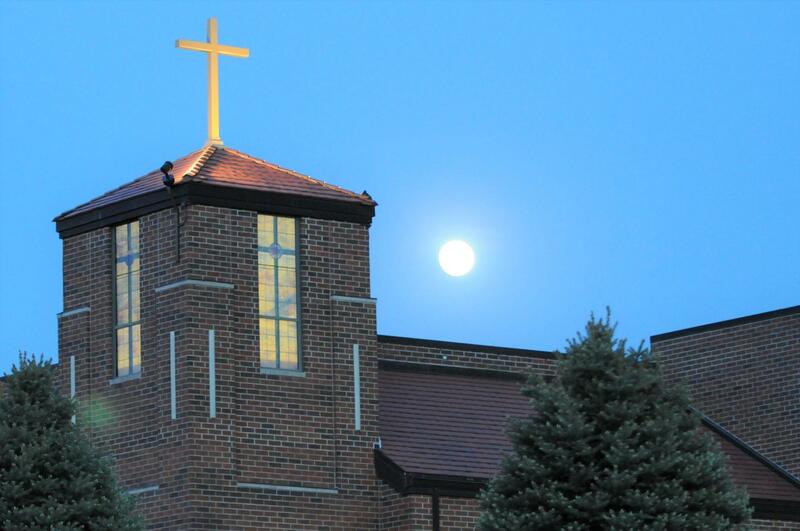 Fulfilling the mission of the school, Saints alumni and students positively impact their parishes, communities and the world through these four core values. Saint Thomas Aquinas remains steadfast in serving all families regardless of socio-economic or academic capability. Parental involvement has always been high and is considered a component of the school's success. Another key factor is the dedicated, supportive faculty that encourages students to live their faith in all things and attain their God-given potential. The school provides a demanding and rigorous curriculum to ensure that its 99-100% college-bound students are well prepared to enter a highly competitive post-secondary arena. Each year, over 50% of graduating seniors receive academic scholarships to at least 100 different colleges and universities. The school has been the recipient of the state-wide academic recognition program, the Governor's Achievement Award, four times since the award's inception in 2006. Saint Thomas Aquinas students also achieved the highest scores in the Archdiocese on the 2011 Kansas Assessment Tests and the highest scores in math and reading for all Johnson County high schools. Saint Thomas Aquinas has been designated as a U.S. Department of Education National Blue Ribbon School based on academic achievement. From the start, Saint Thomas Aquinas has benefitted from exceptional leadership. The school's first president, Blake Mulvany, was charged with opening the new high school, and his competent leadership grounded the school during its first arduous days of policy forming. He was succeeded in 1996 when Sister Kathleen Condry, OSU, who left her position of principal at Saint Thomas Aquinas to assume the role of president, a position she held for two years and capably steered the school for two years until she left to assume a leadership position with the Ursuline Sisters of Paola. Since 1998 -- half of its existence -- William P. Ford, Ed.D., has served as president. A planner, a doer and a listener -- Dr. Ford is a skilled administrator noted for his integrity and ability to continually raise the bar in order to achieve excellence. He is past president of the National Catholic Education Association - Secondary Schools, a membership organization that "provides leadership, direction and service to fulfill the evangelizing, catechizing and teaching mission of the Church." Academic principals, Craig Moss and Brian Schenck, and Student Affairs principal, Mike Sullivan, Ed.D. 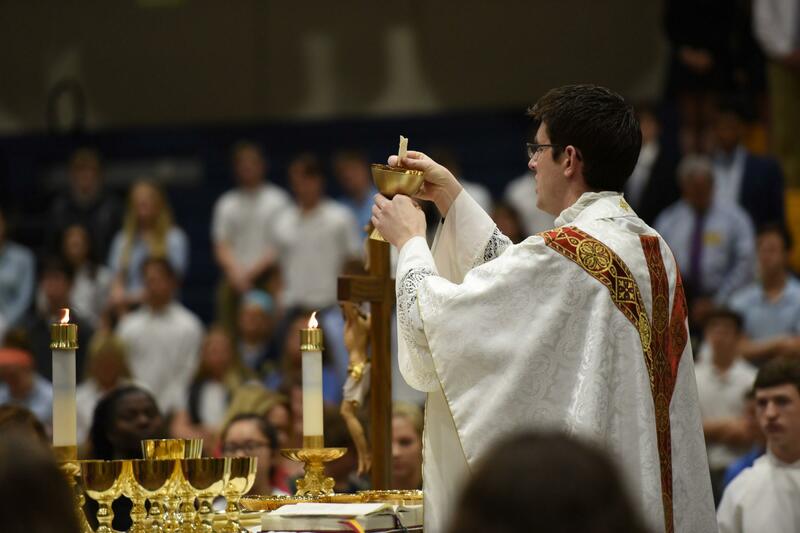 further ensure the school's path to distinction among Catholic high schools. A stable, quality faculty (of whom 81% hold Masters degrees) provide instruction that leads to effective learning and acquisition of the knowledge, skills and values to which the school aspires. Over the years, numerous facility enhancements include the addition of lower-level classrooms, 500-seat theater, auxiliary gym, state-of-the-art science classrooms, Chapel renovation, adjacent building with additional classrooms, athletic stadium and practice facilities. Astute planning has also allowed Saint Thomas Aquinas to keep stride in the digital age. All building additions, technology upgrades and classroom renovations -- including wireless connectivity, web-based applications, laptops and classroom projection devices -- incorporate cutting edge, progressive educational innovations. 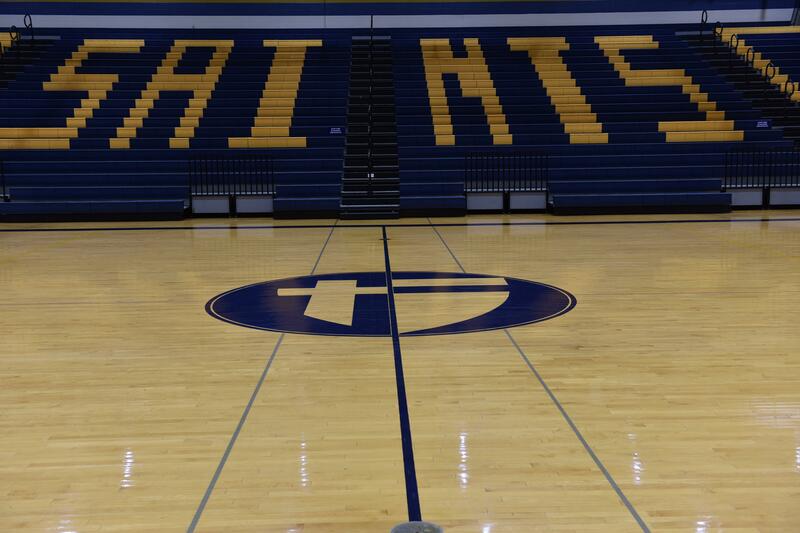 Through the generosity of many donors as well as sound fiscal planning by administration, Saint Thomas Aquinas High School has been able to maintain and enhance our quality facilities and programs without the burden of incurring or holding over long-term debt. Saint Thomas Aquinas has the third largest endowment of any Catholic school, elementary to college, in the Archdiocese of Kansas City in Kansas. Saint Thomas Aquinas has an excellent reputation for its award-winning programs in the areas of athletics, writing, debate, forensics, performing arts, and competitive scholastics. Over 65 clubs, activities and athletic programs enable a young person to explore interests and experience growth and fulfillment in a faith-based environment. Always at the core of a Saint Thomas Aquinas education is the challenge to make one's faith living, conscious and active. 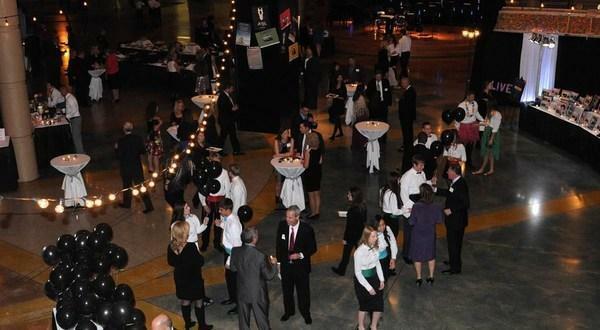 This can be witnessed through the outstanding community and nationally recognized student outreach program that benefits over 800 agencies in the Kansas City area in any given, single year.